Economic problems are an ever-present and inherent part of our lives. If you wish to understand how to improve the living conditions of people in their everyday lives and how to solve economic issues in economic sectors, come and join us! an opportunity to get interested in research activities and awareness of the importance of lifelong learning. You will have the possibility to meet dynamic and experienced academic staff, to acquire unique knowledge in agricultural economics and to improve your knowledge abroad. 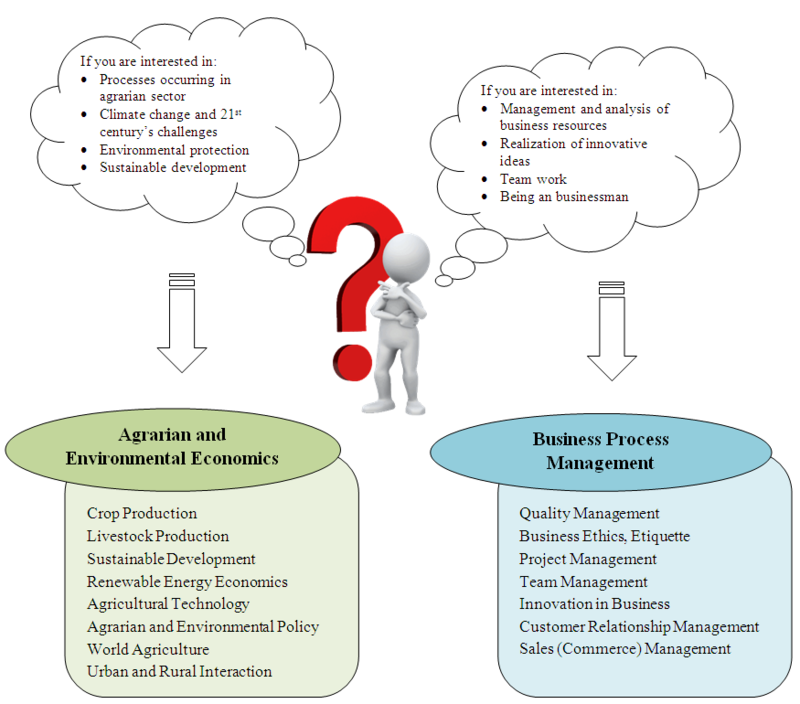 The full–time Bachelor’s degree programme covers 4 academic years, where the 1st and 2nd academic years gives you general skills and abilities for an economist, but the 3rd and 4th academic years give you more specific skills in one of the following specialization directions: Agrarian and Environmental Economics or Business Process Management. Further is given a short guide how to choose your specialization direction, where your choice highly dependent on your interest and what will be specific study courses within each specialization direction: This study programme is completed with the elaboration and defense of the Bachelor’s thesis. Applicants with completed secondary education are approved for admission to the programme. Applicants must have at least a "Satisfactory" grade in Mathematics, must be able to present good English knowledge (minimum - CEFR level B2, IELTS score 5.0, TOEFL score 510, TOEFL-iBT score 64) and need to pass an aptitude test in social sciences. The graduates are specialists who are able to assess a situation in the market, to organize and manage comprehensive entrepreneurship and implement innovative management ideas in rural and urban areas. Our recent graduates are employed in the companies of agricultural, banking and finance sectors, government institutions, academic and research organizations as well as self-owned companies. Bachelor’s degree entitles graduates to continue studies in a respective Master’s study programme at universities in Latvia or abroad.